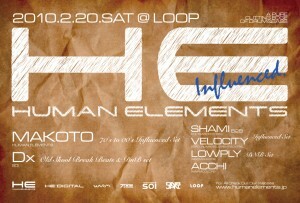 2/20 (Sat) Human Elements “Influenced” @ Loop, Tokyo. Coming this Saturday (20th Feb 2010), there is an event which is a bit different from usual. Every DJs is playing what influenced them. you will hear HipHop, R&B to Jazz, Soul to House, Techno, Jungle,Old Skool DNB over the night !